I was born with an artist’s heart. I have doodled since I was old enough to hold a crayon and have had a longstanding love affair with color and pattern. Numbers don’t stand a chance at sticking in my brain, but I can always remember what color someone’s outfit was or how their living room was decorated. Thankfully I was raised in a home where there was an endless supply of crayons, magic markers and paper! The first drawing my parents saved and the first time I wrote my name. I come by it honestly. My Dad is the most talented and creative person I know. He can draw anything, paint anything, build anything, cook anything … I could go on and on. Aunt Janet painting a window display piece for the shop. Grammy with a quilt that she made for my parents. ​Creative genes run strong through my Mom’s family as well. My Great Aunt Neva was an amazing painter. She was a high school art teacher and excelled at modern / abstract art. Trips to her house for Thanksgiving were always a thrill. A coffee table full of colored pencils and crayons always awaited my brother and me. Her house was a wonderland filled with her paintings, collections and many cats! When I was in college and finally feeling confident in my own artistic abilities I offered her a trade, one of my pieces for one of her paintings. I was thrilled that she agreed and I still cherish the painting I scored from the swap! Aunt Neva and me at my senior exhibition. ​I have counted myself very lucky to have been raised in an environment where my creativity was encouraged. It could easily have been opposite, growing up in this small, southern town, as unfortunately, artistic abilities are not always seen as special and worthwhile. A childhood neighbor, Barry, was always up to some creative project with my dad. Their most memorable projects were murals painted on the walls of the elementary school. Another neighbor (and my Fairy Godmother), Sharon, always told me that she wanted a set of sheets printed out of one of my patterns! In high school I was starving for creative instruction as there wasn’t much offered through the school system at that time. Thankfully, our friend and elementary school art teacher, Mary Ann Cox began teaching art lessons in her home and my brother and I were able to learn from her once a week and soak up all that she had to give creatively. We were able to learn and try different techniques and mediums. Honestly, I would have never been prepared for art school if it hadn’t been for her! ​Off to the University of Georgia I went and found myself in the middle of a creative’s paradise at the Lamar Dodd School of Art. Art School at UGA was a perfect fit for me, having only minimal instruction before college. I was able to learn and grow in my talents with the aid of many kind and helpful professors. It took me a little while to fully break “out of my box” as some would say but when I finally became comfortable and confident in my talents I really soared and couldn’t soak it up fast enough! Art school was an amazing experience, filled with good instruction but enough freedom to “find myself” creatively. I will forever cherish the years I spent at Lamar Dodd and all the creative energy and excitement it brought to my life. There were too many wonderful people at UGA to name them all but Glen Kaufman and Ed Lambert were my creative champions that pushed me to excel more than I ever thought possible in my work. Left to Right: High School teacher and mentor, Mrs. Roberts, me looking goofy, Mr. Kaufman, Mary Ann Cox. And then life happened! Upon moving home, I quickly became immersed in learning how to run a business. I poured everything I had into making this shop work, learning how to constantly be a better leader for my team, and a better wife and business partner to my husband. I let myself slip away from the art world, what little grasp I had on it. I stopped sketching and drawing, stopped dreaming in prints and patterns. I quickly gave up on the dream of setting up a real working studio in the upstairs of my old building with screening equipment and my very own paper beater and press. I let all of my skills become so rusty, I barely remember any of my instruction from art school! My dreams these days are of new ways to display my goods, sets for my pop up shops, window displays and Christmas themes. Don’t get me wrong, this has all been very fulfilling for me. I love owning a shop. I could never imagine a job I would love more than getting to create beautiful spaces every day. You all are probably tired of hearing about how much I love my community and the journey I have been on to become a more compassionate and caring person. So please don’t think I am whining or complaining of “lives lost”. I am right where I am supposed to be, and I know that. ​I am now fifteen years past college days (yes, I am that old) and feeling a bit lost. I am so focused these days on social media, marketing, to-do lists, bills, building repairs and working on my house. I feel like I have hidden away a part of myself that I just haven’t had time for. I have found myself longing for a sketch book and some pastels! I have decided to make it a goal for the year to get back to my creative roots. I am going to start making myself sketch again and work on this creative muscle that is so out of shape! You will notice a theme as we journey through the spring and summer of art and creativity. Through blogs and soon to come new videos we will all be sharing more of our talents with you. I am both excited and scared to death to jump back in to this world I have been so far away from for so long. I assure you I am not planning on producing any masterpieces anytime soon! But it will feel so good to pour a little of my soul back onto that paper! ​​I will be sure to keep you all posted on the progress of my journey and I’ll share some of my “practice” works with you. The good and the bad! If you are reading this and thinking to yourself, “I used to love to paint,” or “I used to love to try new recipes,” then I would like to encourage you to go on this journey with me and get back to giving yourself a creative outlet, whatever that may be. Gardening, cross stitching, quilting, drawing, anything creative that brings you joy. We’d love to hear what you are working on this spring so send us an email or post it on our facebook page. Let’s get creative together! As we prep for the holiday season, we're always busy dreaming up interesting and festive invitations for our Christmas Open House at our brick-and-mortar location, The Shoppes at Fourth and Cherry. This year we have chosen to do a farmhouse themed Christmas. We like to carry our theme out in everything we do--invitations, decorations, menu, etc. "A Farmhouse Christmas" isn't flashy, so we knew we couldn't dress the invitations up with glitter. We needed something a little more subtle to make a statement, so we decided to use a buffalo check patterned paper and create an envelope liner! Envelope liners are a fun way to dress up an invitation or any piece of snail mail! It is such a simple way to make the receiver feel like they are opening something special. *Be sure to choose an envelope and patterned paper that coordinate--especially with your invitation! Now that you have the tools you'll need, you'll want to take a good look at the envelope you've selected. You want to be sure that your liner fits your envelope just right! Use a pencil or marker to draw a line showing where the liner should reach. Next, you'll want to cut your envelope along that line to help you create a template! Now, gently tear your envelope completely open. Since you'll want your envelope liner to fit nice and snug into your envelope, cut along the back of the envelope. You will want to remove all of the "wings" that make up your envelope, except for the top flap! Now that you have your template cut out, trace this shape onto a sturdy piece of cardstock. Cut it out and test it by slipping it into one of your envelopes. Make sure that it fits just right. This is the step where you will need to make adjustments if necessary. Now that you have the perfect template created, you can start tracing on your patterned paper! And slip your beautiful new liner into your envelope! Press it down making sure that all of the edges line up correctly. Your beautiful creation is complete! *Helpful Tip: If you're looking to conserve your patterned paper, you can cheat a little and make your liners a bit smaller. All you need to do is slip your cardstock template into your envelope and trace along the bottom. This will give you a guide to know how far you can shorten your template, without it being noticeable when the envelope is opened! We believe it is the little details that make the biggest impact. This is such a fun way to dress things up and we hope you'll try it out yourself! And, if you're in the area (or are willing to travel), you're invited! We'd love for you to make the trip down and celebrate this Christmas season with us! It's still warm outside here in the South, but there is a change in the air and we know that fall is on its way! Time to spruce up those front doors and welcome in this pleasant time of the year. I thought it would be fun to help you make a beautiful fall wreath for your home. If you are feeling crafty, then grab your hot glue gun and let's get started! All of these supplies will be available at your local craft store. For this wreath, I used two colors of wool grass (two stems of each color), two picks with fall foliage, one pumpkin pick and one gourd pick. You are free to choose whatever fall stems that speak to you! The design concept will be the same, even if you choose something different than what I have used today. First, you need to wrap your wire with floral tape. This will make your wire much easier to work with. Learning to wrap your wires with floral tape is life-changing, and you will never want to work with naked wire again! Start by wrapping the tape around the top of your wire and then pull the tape as you twist it down the wire. The tape is stretchy and will stick better if you pull/stretch it as you wrap the wire. Cut your taped wire into two pieces, one to use for your hanger and one to use for your bow. To make a hanger for the back of your wreath, lay the wire over two fingers, pull down, and twist, creating a loop at the top. Wrap the straight end of your hanger around a chunk of the grapevine on the back of the wreath, pulling the straight end up, and wrapping it around itself. Make the hanger extra secure with a little dab of hot glue. Next, you will need to break down your floral picks. By breaking down your picks and stems, and cutting them into smaller pieces, you will make what you have go a lot further. In the end, this will make your project less expensive to make. I am starting with the long wild grass that was part of my wool grass stems. Start by gluing a piece of the grass down and work your way around the wreath, continuing to glue the sections of grass. *Helpful Hint: Put glue on the end of your stem and then shove it down into the wreath, rather than just gluing to the top. This will make your stems more secure and help hide your glue! Next, add the wooly tops. Divide your wooly pieces in half, using half for the first layer and half for the second. Glue the wool grass to the top surface of the wreath, alternating colors as you work around it. The first layer will all be glued right along the top. As you start the second layer of wool grass, start to fill in on the outside and the inside of the wreath base. This will help build out the shape of your wreath and make it look more full. Now that all the wooly pieces are attached, go back and fill in with the extra foliage that you separated out when you took the stems apart. You can see how the wreath is really starting to take shape and fill out. The trick to this type of wreath is to build it up, layer by layer. We've laid the foundation, now let's add the fun parts! Next, add the bow. You will need about 2 1/2 yards of ribbon to make a simple bow like this. Start by leaving a tail. At the top of the tail, make a small loop that will be the center of your bow. Pinch and twist the remaining ribbon before making your next loop, which will be a little bigger. Continue making loops, making sure that you twist the ribbon between each loop. You should end up with five loops total, one small one for the center and four larger loops. Find the center of your bow, where it all started. You will have three loops on one side and two on the other. Lay the taped wire across the center of the bow. Tightly pull the wire to the bottom of the bow and twist it on itself. After securing your bow with the wire, you can fluff up your loops. Some folks would add the bow at the end, but I like to go ahead and attach it now, so that I can work around it as I fill in with the rest of my fall foliage. I decided to place my bow off center, which meant I needed to move one of the wool grass tops. This is no problem! If you decide you don't like where you've put something, just clip it out, move it, and re-glue it. To attach the bow, wrap the wire around a chunk of the grapevine and twist it on itself until the bow feels secure. Fluff your loops up and place your tails where you want them to hang so that you will know where to start placing your next layer. Next, add the different elements of the deconstructed fall picks. First, I filled in the bare spots around my bow with the leafy greenery. Next, decide where to place the pumpkin and gourd. I placed one on the top of the bow at the center and one on the bottom. Fill in with some extra grass. Something like this will be available to you at your local craft store. This grass just helps to make the wreath look a little fuller, while also adding to the wispy-ness. Now, start to build out the base of the wreath, out from each side of the bow. I added fall leaves to each side. Next, add in some fall colored paper grass and berry pods, again building out on each side of the bow. Fluff up your bow one last time and voila! You have a beautiful fall wreath for your door! You can see in this picture how I used all the extra pieces to build out the bottom of the wreath around the bow. The top of the wreath is just the base of wool grass that we started with. If you are running a little short on time, or if your creative juices are just not flowing, you can buy one of these beautiful wreaths that I've already put together for you! ﻿If you're feeling crafty and would like to take on this project, we have made the elements we've used available to you! ​I'm a little obsessed with notebooks. I keep all of my notes and plans in one single notebook. I figure if I have that notebook and my planner, then all of my important information will be in one place. If you looked through that notebook, you might think that I'm a crazy person because it skips from design consultation measurements, to drawings of decorations for a birthday party, to fabric orders, to billing notes, to grocery lists… But for me it helps to know it's all in one place so I'm not constantly looking for little scraps of paper. I think most people have a use for a beautiful journal or notebook, so why not make one for them (or one (or 10) for yourself!). For this post, I'm using a spiral notebook and only covering a portion of the front. At the end of the post, you'll see pictures of the same process used on moleskin notebooks in case you'd rather do that. Both really turn out beautifully. Side note: just make sure that if your notebook has a design on it, like mine does here, to pick a fabric that is dark enough so that you won't be able to see through it. If the notebook is solid colored (like the moleskin) this won't matter. Ok, these instructions sound a little complicated but I promise it's not AT ALL. You can make these in about 10 minutes. Here we go! ​1. Iron your fabric so it's nice and straight and a little easier to work with. 2. Open up your HeatnBond Ultrahold and lay it on your work surface paper side UP. 8. When you have the front "tacked down" with the iron, turn your notebook over and fold one flap in and iron down. Here's one of the moleskin journals- With these, the only difference is that I didn't use the "flaps." I traced the journal on the the paper side of the HeatnBond and then cut about an inch around my traced shape. I ironed the whole thing to the journal while is was laying flat and then used sharp scissors to cut around the edges really carefully. The HeatnBond (Maybe I should be getting paid for this…) will keep the fabric from fraying, so you don't have to worry about the raw edge. One of my favorite things to do is to make a pretty cake. I love the art of baking, and I love the art of decorating! A simple yet showy cake that wows the crowd is an ombre layered cake. This cake is fun because from the outside it appears to be plain Jane. When it is cut, you have a surprise! This cake is great for a baby shower, Valentine's Day, birthday parties .... with so many color options it is sure to be a winner. For this cake, I choose my favorite cake recipe, making one and a half batches (for a larger layer cake). You will make your recipe of choice as usual, scraping down the sides and bottom of the bowl to ensure a smooth mixture. I like to use AmeriColor Gel Paste-Food Color. You can pick it up at any craft store--you might as well get a few different colors to have on hand because you'll love it! Gel food coloring comes in an array of vibrant colors and it holds that color in baked goods better than traditional food coloring does. It is beautiful when used in frostings and it also works well with fondant! I mad ethis particular cake for a baby shower. The couple is having a little girl so my color choice was simple: soft pink. Ombre--having colors or tones that shade into each other in which the color is graduated from light to dark. Light to dark--that's the idea! I call this cake simple because rather than having to split the batter before you color it (like a rainbow cake), you just color it a little at a time in one bowl! Once your batter has been mixed and is smooth, begin by adding one or two drops of coloring to your bowl. Turn the mixer on, then stop it to scrape the sides and bottom of the bowl, and mix again until it is evenly incorporated. Now your first and lightest layer color is ready. You will want to come up with a measurement for the amount of batter used in each layer so that they turn out (somewhat) even. Dip the decided amount of batter into a pan and set aside. Now, go back to your bowl of batter and add one or two more drops of color. Turn the mixer back on until it is evenly incorporated again (scraping the sides and bottom of the bowl ensures that the batter is evenly colored). Dip up your next layer and move on to the next one! Repeat this process until you have used all of your batter dipping up the desired number of layers. You want to be sure that you add enough coloring to each layer that a difference can be noticed, but not so much that you can no longer make the layers any darker. This happened to me on the last layer--soft pink can only go so dark! I ended up adding a tad of red and all was well. Just be aware of that tiny detail when you start! Once all of your layers are baked and cooled, begin with your darkest layer on the bottom. Continue icing the cake as usual, stacking the next darkest layer. Once your cake has been iced between each layer, admire your beautiful work before you cover it up! It should be stacked lightest to darkest from top to bottom. Ice the outside of the cake and call it a day. You are sure to please the crowd with this sweet and simple creation. I LOVE to wrap presents! After 12 Christmas seasons in retail, you would think that I would be tired of gift wrapping by now! Lovingly wrapping gifts is one of my favorite activities that comes around with the Holidays. Every year and I am scouring the after Christmas sales for cute gift wrap, cards, tags, etc. I was too embarrassed to take a picture of my entire gift wrap collection so I just picked a few of my favorites to show you! I think it is so much fun to dress up my packages and put extra thought into the presentation of the gift. Here, I am sharing with you a few of my tips on creating beautiful and special gifts! I like to set up and wrap all of my gifts at one time. Your dining room table or living room floor with look like a Christmas explosion for a couple of hours but the end product will be so worth it! Along with cute wrapping paper, it is nice to have a selection of tags, small ornaments, bells and stems to decorate your packages with. You will also need tape (I prefer "Scotch" transparent), scissors, assorted boxes, and perhaps wire cutters, depending on the decorations you are using. I never wrap presents without the trusty tape dispenser that was my Grandpas. It is very heavy and has sharp teeth. New dispensers just don't cut it, they just don't make em' like they used to! When wrapping in a box, it is fun to line the box with tissue to add an extra bit of fancy. Lay out your tissue long ways, folding up one end to make it fit perfectly inside the box. Once you have folded the tissue, make sure that you carefully insert the tissue along the edges to keep it from ripping. Fold your gift to the best fitting size and lay it in the box. Bring one side of the tissue over the gift and then bring the other side, folding the edge for a finished look. You can even secure the tissue with a fun Christmas sticker if you have them! Next comes the wrapping. This paper happened to come in sheets that were the perfect size to wrap a standard shirt box. No cutting necessary! So I laid the top side down and pulled the paper around each side to meet in the middle of the bottom of the package. I do not tape the paper to the box, but if you are having trouble keeping the paper in the right place you can do that! I then tape the paper to itself to keep it secure. On each edge of the package, I press in the ends of the paper while I crease the top and bottom portions at an angle that will lay flat. I bring the top piece down, creasing the seem, and bring the bottom piece up tightly securing it with tape on either side. I like to crease the edges with my fingers to help make the package look crisp and neat. Choose your embellishments based on the color scheme and attitude of your paper. You will want it all to coordinate and make sense to the receiver. When tying ribbon around all sides of the package, you want to measure before you cut. This will ensure that your piece is long enough to wrap and tie a pretty bow. Lay the ribbon across the front of the package and wrap around to the back. Cross the ribbon in the back and bring the ribbon around the other sides. Once you have the ends of the ribbon on the front of the package, adjust the ribbon until you know that you have enough to tie your bow. Now you can finally cut the ribbon to size. Once you have cut your ribbon down to size, you will need to tie a knot to keep things in place. Now it is time to layer your other embellishments and finish your package! You will always want to thread your gift tag first, so that any other little do-dad can be seen. When I am including a small gift item (like these earrings) in the same package as a larger item, I try to make it look a little special. This way the gift receiver is sure to notice it and not throw it away with the tissue paper. When you are using a roll of paper rather than sheets, cutting is a must. Roll out your paper, print side down, and place your box on top, top side down. Cut your paper down to size ensuring that you have enough to cover the entire box. Wrap your gift as stated before. With this print, we chose to go with a natural and rustic theme with the embellishments. We tied the jute twine, as we did before, wrapping around all sides of the package. We wanted to use a pine cone to dress it up a bit! Once we tied a knot to secure the twine, we began attaching the pine cone. We have found the easiest way to do this is by threading the twine between the bottom later of the pine cone and tying a tight knot to hold it in place. Then we are able to finish our bow! Sometimes rather than a traditional gift tag, I like to use Christmas cards! We've all heard the saying, "Measure twice, cut once." What happens when we don't follow this piece of wisdom? Is all lost? Certainly not! Though it isn't ideal to end up short on wrapping paper, sometimes it's an easy fix to use scraps to fill the gap! Start by measuring your gap, and cutting a piece of paper to fill it. Tape down (on the back of the package of course) your fill in piece right in the middle. Bring your sides up like you would normally do and tape them to the fill in piece. Continue to wrap the package as you would normally do, being mindful of keeping everything tight and secure. From the front, no one would ever guess that this package was pieced together! When only tying ribbon around one side of the package, I tend to wrap it around the taped side. I tied a tight knot and moved on to embellishments! Don't be afraid to use festive stems or unusual objects. The more interesting the embellishments, the more fun it is for the receiver! Here is one more example of using a stem to dress up a package! When prepping tissue for a bag, open one piece up fully. Put one hand under it, finding the middle. Use your free hand to pick up the tissue in the middle, pulling upwards quickly. Gather the bottom portion and begin stuffing the tissue in the bag around the gift. Do this with individual pieces of tissue until your gift is covered and the tissue looks nice. Don't be afraid to add embellishments to your bag! I hope this was helpful and that you feel inspired to toss the premade sticky bows and put a little extra umph into your gift wrap this year! We have made some of our favorite wrapping paper available for you to shop! Here, in the south, most of us are blessed with plentiful pine cones to pick up in our yards. This time of year there are so many cute things you can do with those treasures! One of my favorite pine cone projects is to make a wreath. Dad and I have made many of them for the shop, all of them gigantic! Here, he will show you how to make a pine cone wreath for your door or porch. For this project you will need: pine cones, floral wire, wire wreath base, spray snow, glitter, ribbon of your choice and work gloves. All of these supplies can be found at a craft store near you, such as Hobby Lobby or Michael's. Next, you will want to wire all of your cones in advance, this will make the job go faster. Wrap the wire around the tops of the cones, leaving plenty hanging off to attach it to the wreath. One the cones are wired, you will begin to attach them to the wire base, beginning on the outside and working around the circle. Once you have completed the outside of the circle, begin attaching them to the inside of the circle. Once you have completed the inside of the circle as well, begin filling in the middle of the wreath base. When you are finished attaching the pine cones, you can spray the whole thing with the spray snow. While the snow is wet, sprinkle the wreath with glitter. Any color you like will do, but I have found that silver, gold or a pale blue make the prettiest wreaths. You'll need to give your wreath plenty of time to dry before attaching the bow. All that's left to do is hang your beautiful creation and impress all of your friends! When my older son, Seth, started preschool in 2007, I was put on the Thanksgiving party committee. We had turkey sandwiches (cut into turkeys using cookie cutters), cookie pilgrim hats, apple slices with pumpkin pie dip, and moon pie turkeys. I had decorated moon pies for Halloween after seeing the idea in a magazine (probably Southern Living, All You, or Family Fun, I don’t remember which). I had several moon pies, bags of candy corn, and chocolate almond bark left over, so I got creative and came up with moon pie turkeys! Now, if you are not from the South, you may not know what a moon pie is, but let me tell you, there is not a more Southern snack than a moon pie with an RC Cola (except maybe peanuts and a glass bottle Coke!). A moon pie is “the perfect combination of marshmallow, graham and chocolate” - just check out the story on www.moonpie.com! Simply melt chocolate almond bark and place in a piping bag with a small round tip. Insert candy corns point down into the edge of the moon pie to make the turkey’s tail feathers. Pipe the melted chocolate around the top edge of the moon pie. Next pipe a dot of chocolate on the flat side and place a candy corn on it point down again to make the beak. As the chocolate dries, it will hold the candy corns in place. I also like to use orange candi-quik to make the eyes by just piping two dots over the beak. I use mini moon pies when I can find them, just because they are the perfect size for kids to hold on to and eat, and usually there are plenty of other desserts around! I love having a Thanksgiving tradition that’s fun to make with my kids! I hope you’ll enjoy making your own moon pie turkeys! Do you have any other fun Thanksgiving traditions? We’d love to hear about them! Tell us in the comments below or on our Facebook page. You know we love a craft here at The Southern Mercantile, and we have a great one from our new friend, Lauren Train. She's a southern gal too with her own blog at www.talkofthetrains.com. 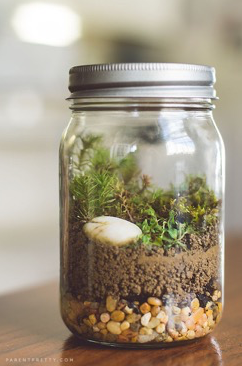 This Mason Jar terrarium is a great craft to entertain the kids at home this summer or just to add a little green around your home. Tell us what to do, Lauren! Today, I am happy to share with you a easy, affordable and adorable DIY craft! 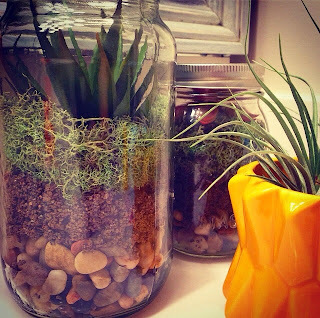 These Mason Jar Terrariums are the perfect blend of southern and fun with a hint of greenery to add a pop of color! I liked them because they were fast, make for simplistic decor and can also be educational. By educational, for us, I mean that in the sense that my four year old and I briefly chatted and she understood plant + water + light and ecosystem. This image and the link below were the inspiration for our easy terrariums. The post below includes more detail on the rocks as a drainage system and "activated charcoal" - which I did not use. It prevents mold build up though, I'm pretty sure? Accessorize - I saw some little boys who loved action figures add them to their plants. It was kind of cute and unique to see - here is the sample of one with dinos below and the link from where I found it! How cute! Anyway, simple and the kids love the dirt and watching their little terrarium come together! Thanks, Southern Mercantile for letting me guest blog today! Come visit me for more fun ideas at the links below! We were so inspired by Lauren's DIY, we found a few more cute ideas to share with you! Click any picture for the link. While in the spirit, we're going to get a little creative with book pages! Our friend, Melissa Dark, has a wonderful tutorial for making a book page wreath. We asked if she would like to teach all of you, and she has graciously accepted! Take it away, Melissa! You want to know how to make your own book wreath? First you will need a straw wreath form and burlap cut into approximately 2 inch strips. For a 24 inch wreath, you will need about a half yard of burlap. Wrap the burlap strips around your wreath. Secure ends with hot glue or straight pins. Next, you will need an old book. You could just as easily use a new book, but the yellowed pages of an old book give the wreath more interest. Carefully cut, or gently tear, the pages from the book. Roll each page into a little scroll and secure with hot glue. Tie each scroll with twine. I mostly tied singular scrolls, but I also tied a dozen or so multiple bundles (2 or 3 scrolls tied together). It will take about 75 scrolls to cover a wreath. Use strait pins or hot glue to secure the scrolls to the wreath. Here's a helpful hint...I glued my multiple scroll bundles (2's and 3's) to the wreath first in even increments (think of a clock- tie bundles at 12, 3, 6, and 9) and then filled in between those. Glue a small loop of twine to the back of the wreath as a hanger.